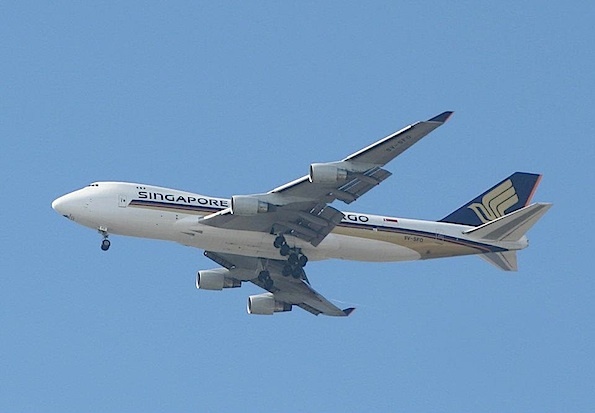 Singapore Air Cargo Boeing 747 passes over Arlington Heights. Chicago Mayor Rahm Emanuel on Monday unveiled a $200 million International Cargo Project that he claims will create 1,200 construction jobs, 1,200 permanent on-site cargo jobs and another 10,000 regional jobs over the course of a decade-long development. The cargo center could boost the Chicago economy if plans succeed. The cargo site is on the complete opposite side of existing cargo areas on the southwest side of the airport near Bensenville and Elk Grove Village. Aeroterm LLC, the city’s designated developer, will contribute $130 million to the 840,000-square-foot cargo center which will be built on 65 acres of former military land on the northeast side of O’Hare International Airport. Another $62 million will come from O’Hare airport funds. The City of Chicago acquired the military land in 1996 when the Air National Guard’s 126th Air Refueling Wing moved out. With common wind conditions from the west, that could mean a lot of midnight and early morning cargo takeoffs from runway 27R at the far north end of the O’Hare International Airport. The use of the runway would be a short taxiway to the east end of Runway 9L/27R from the new cargo center at the northeast corner of O’Hare International Airport. Aircraft headed for China and Europe via a flight plan over the arctic circle region of the globe would take a right turn over Elk Grove Village and southern Arlington Heights to head north after taking off from the due west Runway 27R. Runway 9L/27R is the northernmost runway at O’Hare International Airport. The runway was originally touted as a runway that would be less commonly used because of its distance from the passenger terminals. The runway was touted as being useful during inclement weather when visibility is low and its separation from other parallel runways would be useful because of its greater distance from the other parallel runways. Orange runways are planned or new runways. Blue runways are existing runways or runways that are planned for closure Click color for details.